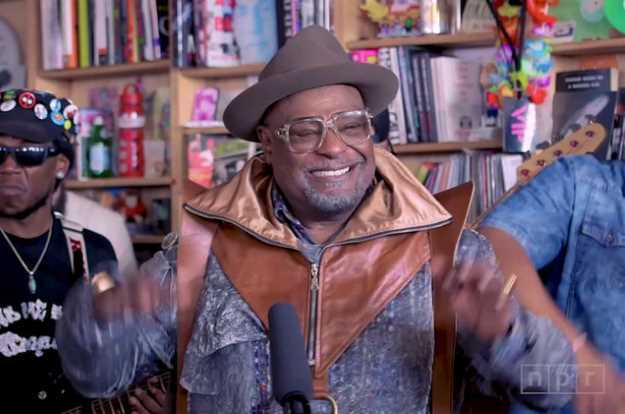 Funk music legend George Clinton stopped by NPR’s Tiny Desk concert series with The P-Funk All Stars recdently to perform a three-song setlist of classic funk hits. Starting off with 1974's classic "Standing On The Verge Of Getting It On" Clinton and his 8-member entourage played their way through a powerful and funky performance that included backup vocals from the funketeer's grandchildren: Tonysha, Patavian and Tairee. Dressed to the nines in a unique style that appeared to be a mix of leather and acid washed jean material, the group then performed their 1978 hit “One Nation Under A Groove," which inspired the typically sedate audience of NPR staff members to happily sing and clap along. To see the full funktastic performance, look below.